marko-cli comes packaged with useful commands for building Marko projects. Projects created using marko-cli come bundled with an HTTP server, and a build pipeline using lasso making it very easy to get started. Creating nested component directories is not required, but we recommend isolating most components in their own directories. Many components will contain additional files and tests that live alongside the component. Too many components living in a single directory will become very untidy and difficult to manage. Let's begin by adding some initial component code to the color-picker. h1 -- Welcome to Marko! Navigating to localhost:8080 should show us an unordered list with list items for each of the colors that we passed as input to our component. We've created our first component! This component will eventually have nested components. When creating components, it's strongly recommended to consider how components can be broken down into multiple components. Each component can then be independently developed and tested. The color-picker component should now have access to all of the child components that we just created, and we can develop them all independently. 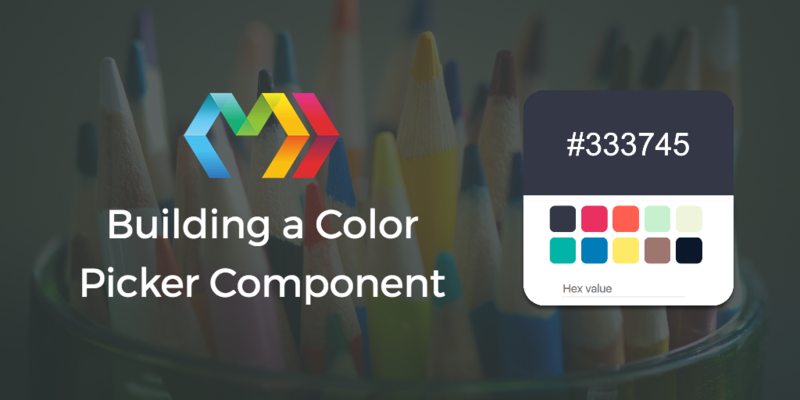 Let's start with with the <color-picker-header> component. We've already determined that the header should have a specific background color and display the value of that background color in text. The color to display should be passed in as part of the input. That's it! Our <color-picker-header> is complete with styles and component logic. This component is small enough to be contained in a single file, but as components grow larger, we should split out the markup, component logic, and styling. We will see an example of this soon. Now we need to revisit our parent component and add the <color-picker-header> tag to it, so it will be rendered. Marko will automatically watch the state object for changes using getters and setters, and if the state changes then the UI component will be re-rendered and the DOM will automatically be updated. In this component, we've introduced on-click and on-touchstart listeners and a single event handler function. Marko components inherit from EventEmitter. When this color is selected, it will emit a click event and get handled by the handleColorSelected function. The handler then emits a color-selected event to be handled by its parent. We will eventually write code to relay this information back to the <color-picker-header>, so its background color and text can be changed. In the <color-picker-footer> component we need to iterate over each color that was passed as input in colors. For each color, we create a <color-picker-selection> component and pass the color using the color attribute. Additionally, we are listening for the color-selected event emitted from the <color-picker-selection> component and handling it in our own handleColorSelected method. We provide the color as the second argument so that it will be available to the event handler method. We also have added an input field and a on-input listener, which will trigger a change to the selected color when the user manually enters a hex color value. Finally, we've added our <color-picker-footer>, passed the state.colors as input to it, added a handleColorSelected event handler for the color-selected event emitted from <color-picker-footer>. When we handle this event, we update the state of the <color-picker> component, which is passed to the <color-picker-header>. Congratulations! You have finished your first fully reactive Marko UI component! Now let's talk about some additional topics that will turn you into a Marko pro! Routes can be specified by creating subdirectories under the routes/ folder. The routes/index route is automatically registered as the index of the application. In a route directory, an index.marko or a route.js that exports a handler method may be created. marko-starter is the underlying project that handles the routing, and automatically resolves routes from the routes/ folder. See the marko-starter route documentation for more information. Alternatively, having an index.marko file in the root directory of your project (e.g. /marko-color-picker/index.marko), will automatically get served as the index route's template. More information about Marko component testing can be found in the marko-cli component testing documentation. Developing Marko UI components is fun and easy! As you're developing components, you should consider how a component can be split into multiple components. This makes developing, managing, and testing components significantly easier. Marko gives you the tools to easily develop awesome UI components. Get started today! Special thanks to Anthony Ng for helping with this tutorial!